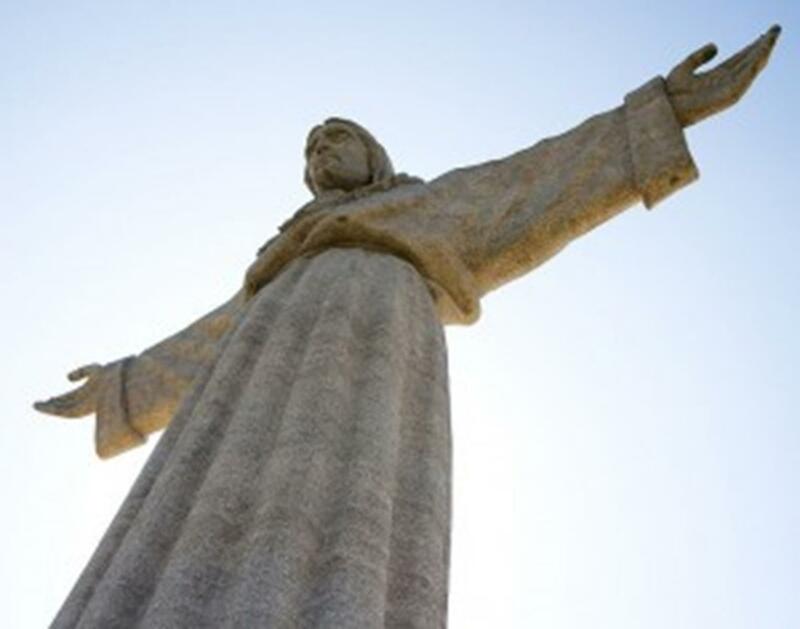 Standing 260 feet high atop a 436 feet high hilltop, the Cristo-Rei statue, or Christ the King, proudly looms over the city of Lisbon. If it seems like the statue is rather familiar, that’s because it probably is. The monument was created as a smaller scale replica of the famous Christ The Redeemer statue, or Cristo Redentor, in Rio de Janeiro. Aside from Rome and the Vatican, the Cristo-Rei is one of the most visited religious sites in Europe, and draws visitors from all across the globe. The statue boasts a prime location overlooking the Tagus River, and as the river is home to Lisbon’s two primary ports, Doca de Alcantara and Santa Apolonia, both of which welcome European cruises each and every day, it is often one of the first glimpses travelers receive of the Portuguese capital. It’s also one of the city’s most popular attractions for both visitors and locals, as an estimated 81 percent of the Portuguese population identify as Catholic, with many making pilgrimages to the site and even more worshipping at one of chapels housed within the statue’s base. The original monument in Brazil was erected as a symbol of peace, hope, and protection for the residents of Rio de Janeiro, and many believe that its European counterpart was created for similar reasons. However, it’s generally understood that the proposal to build such a bold and somewhat imposing structure was a request to God to protect Portugal from World War II, and that the actual construction was given the go-ahead as a way of expressing gratitude that the request was met and Portugal was able to remain neutral throughout the conflict. When booking group travel to the site of the monument, transportation is an important feature to consider, as the statue actually stands seven miles from heart of the city, across the river in the Almada district. While many visitors choose to take a local bus from the center, perhaps a more pleasant alternative, especially for those traveling in larger groups who want to remain socially active, is to take a ferry from Cais do Sodré near the cruise ports. In fact, with the ferry crossing taking between 10 and 20 minutes, and the bus journey lasting for approximately 30 minutes, it’s also the better choice for groups with only limited time in the city, such as cruise passengers. The Christ The King statue isn’t the only design Lisbon has seemingly taken from the Americas, with the 25 de Abril Bridge (which spans the Tagus River between mainland Lisbon and Almada) looking remarkably similar to San Francisco’s Golden Gate Bridge, with a resemblance in both color and design. The bridge is yet another major tourist attraction in the city, and many visitors try and squeeze in a trip to the bridge, even on very short itineraries. Here’s a trick for travelers short on time: visit the 269-foot-tall observation deck in the base of the Cristo-Rei monument. Not only does this provide fascinating views over the city, it also creates an unrivalled vantage point over the spectacular bridge, the river, and the Atlantic Ocean. Like the Brazilian original which is prominent in Rio de Janeiro, this Portuguese monument can be seen from almost everywhere in Lisbon, and with its wide-open arms encompassing the city and the reasons behind its existence, it really is the ultimate symbol of peace and hope. Lisbon is an excellent travel destination for groups wanting to experience some of the world’s most important religious sites, and for those especially interested in the birth and ongoing devotion to Catholicism throughout Europe.